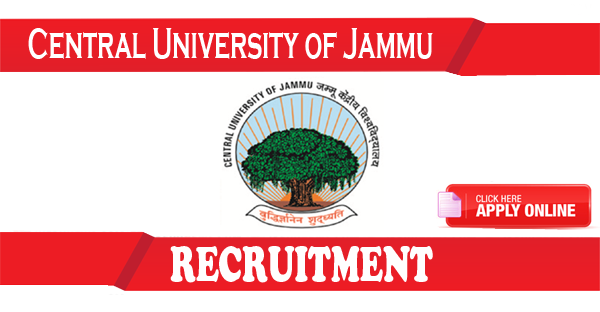 Central University of Jammu Recruitment 2019: The Central University of Jammu has recently released a notification of the Central University of Jammu Librarian Recruitment 2019 for only one post on deputation or direct recruitment basis. So, all the dynamic, eligible & interested candidates who are looking for the Govt. sector job should try for the Central University of Jammu Recruitment 2019. As per the prescribed format of the notification any of the eligible and interested candidates belongs to Indian citizenship can apply directly via offline for the Central University of Jammu Recruitment 2019 before the passing of the last date of 4th Feb 2019. Application Fee Rs.1500/- have to pay through Demand Draft. Candidates should be a Master Degree holder in Library Science/Documentation Science/Information Science with minimum 55% of marks or its equivalent in a point-scale, wherever the grading system is followed or implemented. Has 10 years of experience as a Librarian from any levels of the University of Library or has 10 years teaching experience as an Assistant/ Associate Professor in Library Science or has 10 years of experience as a College Librarian. Has evidence of innovative Library service along with the integration of the ICT in the Library. Has a Ph.D. Degree in Library Science/Documentation Science/Information Science/Achieves & Manuscript keeping. The prescribed application format for submitting have to attach with essential self-attested supporting documents, clear photocopies of the degree, certificates, marks sheets, experience certificates, caste category certificate (it is applicable)issued by the competent authorities. Any incomplete or insufficient applications will immediately be rejected. If the given space in the application seems incomplete, then any extra information may be given on a clearly white separate sheet as per the duly signed format by the candidates same with the added page number as the original application form. Candidates should have all the minimum above mentioned prescribed qualifications and experiences. If he/she found less than of it, then his/her candidature will immediately be rejected or will not be entitled to the interview as per the UGC regulation act. The date for determining the required eligibility such as age limit, qualification & experience in every respect will be as per the application receiving as prescribed in the advertisement. The candidates, who have degrees from foreign universities, should have an equivalent certificate issued by the Association of Indian University, New Delhi. Application of the prescribed format can be downloaded on the universities website cujammu.ac.in as per the recent notification of the Central University of Jammu for the post of Librarian. The downloaded application form should be complete in all respect and after filling, for submitting have to send along with the Demand Draft of Rs.1500/-(Except the candidates belongs to SC/ST/PWD (Person With Disability) or is the regular employee of the Central University of Jammu) from any Nationalized/ Scheduled Bank drawn in favor of the Central University of Jammu, has to send or pay only at Jammu by post at the below mentioned postal address. Candidates must have to write on the envelope ‘the post applying for’; ‘No. of Employment Notification’ & also the ‘Date’. If there is any delay in sending the application before the final date of application submission of 02 Apr 2019 by 5:00 PM, the university will not be responsible for any delay, the application received after the last date will certainly be rejected. For other additional details, candidates have to visit the official website of the Central University of Jammu at cujammu.ac.in. Deputy Register-Human Resource Wing (Central University of Jammu), Rahya-Suchani (in Bangla) at the district Samba- 181143 in Jammu (J&K). The Central University of Jammu was established on 08, August 2011 immediately after the appointment of the Dr. S. S. Bloeria the first ‘Vice-Chancellor’ with Central University Act 2009 (As per the Act No: – 25 of 2009 with Central University Act 2009).